Alright! I have now setup my third (and hopefully final) Amazon store. This one is woefully lacking in items listed. This is my oldest blog and I have used so many various resources throughout the years to get to where I am today that I’ll be surprised if I remember them all. I will continually add to the list as I remember (and scour my brain, computer, and bookshelves to jog my memory). As of this moment, it has a list of all the store-bought gluten free items we have tried (and liked). I have a list going of what we liked, what we hated, and the ingredients of each item. My goal is to take all that information and figure out the right mix of gluten-free flours that we will like. Right now, it seems as if there will be two (can’t remember if I’ve already typed that or not in my last post): one for quick breads/pancakes/muffins, etc. and another for bread like foods (you know, white bread). I discovered that with each product link, I can add my own notes (so, of course, I did with all the products so far). The other things I have listed are all the knitting and crochet books I have. Those I also know are not complete lists but I’m pretty sure I’m only missing a few. I have cookbooks listed and yes, that is not a complete list. I will also include a list of books on gardening/homestead but my brain’s a bit fried right now so that list is empty. The link to the store is to the right and along the top of the page (I figured doing a store like this would be easier than a links page, where we know web sites tend to disappear over time). Also, here’s the link: My Amazon Store. I won’t be posting an update every time I post something new to the store. Just know that it’s there: a constant reference list of all the things I have enjoyed and learned from over the years. Let me begin this post with a disclaimer: I know nothing about real naan bread. I’m pretty sure I’ve only had real Indian food once. That was at a restaurant in London, with a friend standing next to me saying, “Try that, not that” as he steered me away from the really spicy foods (I couldn’t handle those at the time). I really can’t recall if there was anything there that resembled a bread product. So, why am I making naan? My husband. He bought some at Costco (La Brea Brand) and really loved them. So, I thought, how hard could they be to make? Well, they aren’t very difficult to make. It’s really the cooking that is tricky. I will explain that in a bit. First, I tried two different recipes. 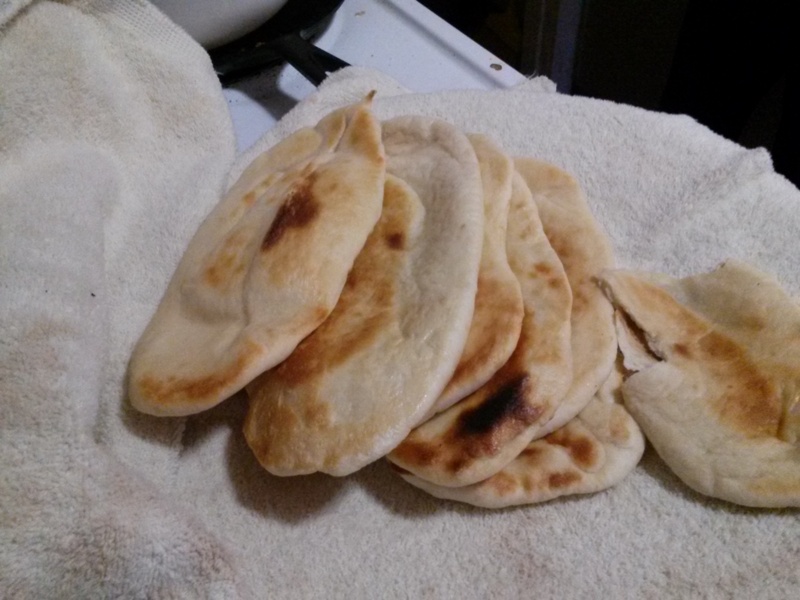 The first was this one: How to make the perfect naan bread. She basically took a few recipes apart and put a new one together, with hers calling for water as the liquid and yogurt. She said it’s the perfect one, right? Well, maybe it was the cooking method I used (which I read about on another web page) but I doubt it. I placed two rimmed baking sheets in the oven and turned on the broiler. 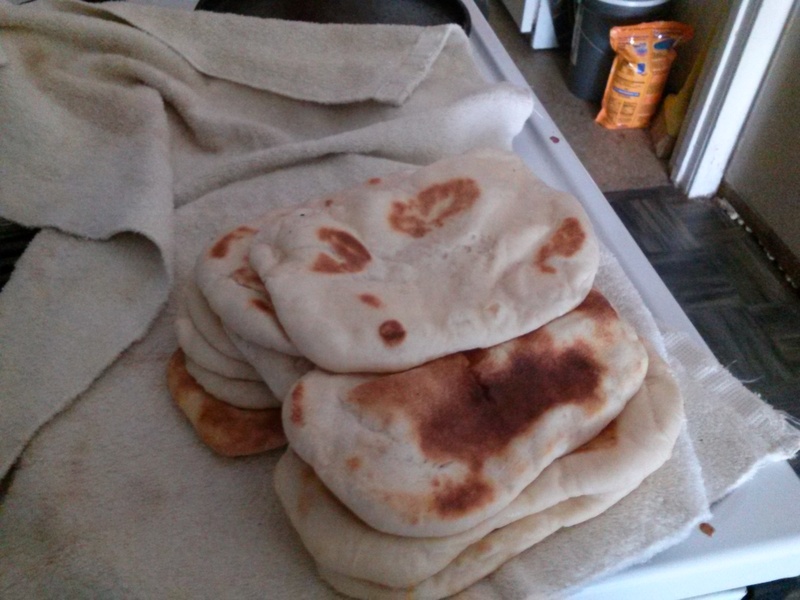 Once the sheets were hot, I placed the naan on the baking sheets and watched them carefully as they cooked. These had a fantastic flavor but didn’t have … not sure how to describe it, but they weren’t as elastic as they should have been. These were still warm also but look at the difference in texture/density. 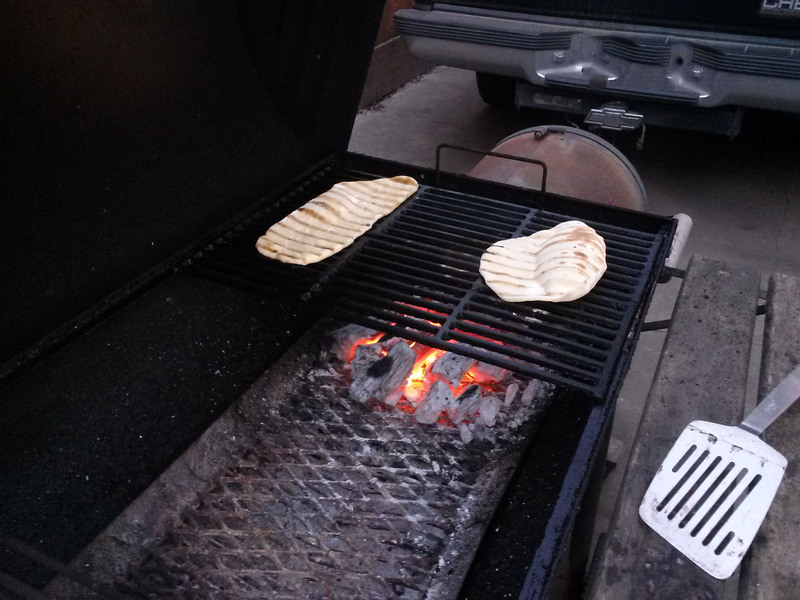 I just did this recipe (February 27, 2015) and cooked the bread on the charcoal grill. FANTASTIC! The flavor was perfect and the texture was fantastic! We learned the hard way NOT to roll them too thin or immediately put them over the coals (we ended up with a giant burned cracker). Here’s a picture of how we cooked them, followed by the recipe. The first loaf of bread I ever made was challah. I had to be … maybe 12 years old? I don’t remember the exact age but do remember where we were living (so that narrows down the time frame a bit). I also remember that beautiful loaf of bread. It was gorgeous and HUGE! I was so proud! Well, until I cut into that dark golden crust to find raw dough (just about an inch of the dough had cooked … the rest was raw as can be). 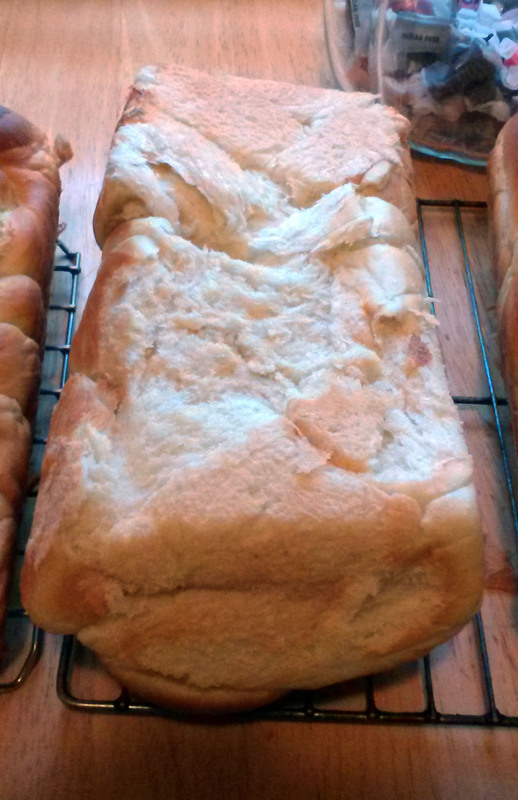 That was also the last time I made bread until I was an adult. I’ve made bread that resembled a chunk of concrete to bread that resembled a dried glob of glue but I was determined. It’s taken me many years of trial and error to figure out exactly how long to knead and how much flour/liquid to add to obtain the right consistency. I’m very happy with my bread making skills (I’ve worked hard for them 🙂 ). So, while trying to figure out a way to pay back my neighbor for finishing off the front yard that we started whacking on Valentine’s Day, I decided on challah. I have been wanting to make it so long and this time (yes, this was the first time I had made it since that day too many years ago) it was beautiful (and edible)! I used a recipe I had written down and stuffed in my binder of recipes. I have no idea when I wrote this down or who it was who originally shared it (may have been a friend who lives in Israel) BUT I discovered (while doing my favorite activity … searching the internet) a woman who pretty much uses the same recipe on You Tube! The recipe she uses makes 4 huge loaves. The recipe I have makes 6 standard loaves (so, just cut the dough into 6 pieces instead of 4 and you are good, unless you have a large family or are making this to take somewhere). So, here is the playlist of her videos, plus a couple more. The first video is an amazing demonstration of various ways to form/braid rolls and loaves. I just sat there with my jaw open, in shock that there are so many different ways to manipulate the dough! The second is a woman demonstrating the various braiding methods for loaves: from 3 strands up to 9 strands. I cut the dough into 6 sections and made 4 loaves. The bottom of the loaf stuck like crazy to the pan. So, those took care of four of the dough chunks and this is what I did with the other two. I cut each of them into 6 sections and made sandwich rolls out of them. Now, these look beautiful but I cooked them way too long. That’s what happens when you turn the timer off (because they weren’t quite brown enough) and then proceed to talk to the neighbor about how her grandson is doing. 3 of these large rolls is the equivalent to one loaf. 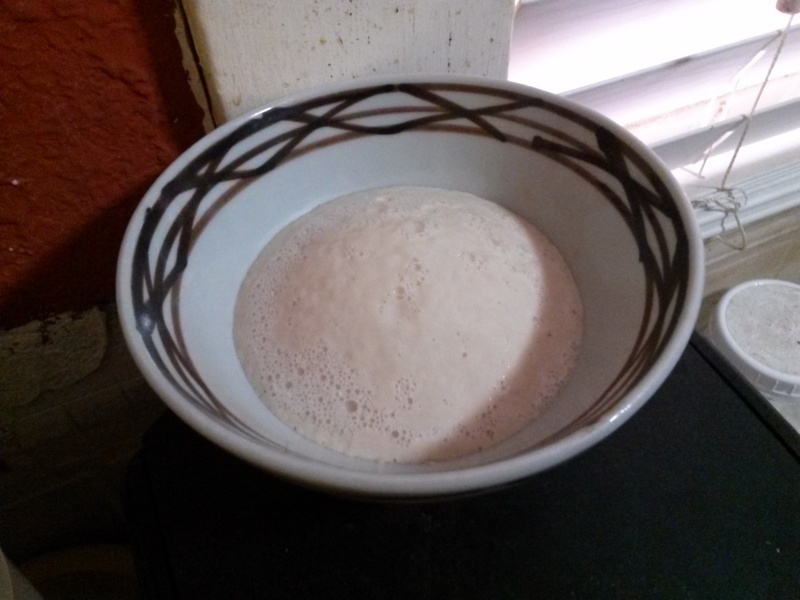 In a large bowl (remember, enough dough for 6 loaves of bread), pour in the warm water (How warm? I test on my wrist: if it doesn’t make me flinch, it’s good. For more specifics, check out this web page: Yeast Is Fussy About Temperature) and whisk in the yeast and sugar (I use Saf-Instant. I don’t bake a lot so once opened, I store it in the freezer. I have had the most consistent results from this yeast even when it has expired). Let sit in a warm spot until it looks like a layer of foam is across the top of the liquid. In a smaller bowl, break the eggs into it and whisk in the salt and oil. Once the yeast is ready (proofed), whisk the egg mixture into the yeast until everything is well incorporated and you can’t see chunk of egg. Now, for the fun part: adding the flour. Using a large spoon, stir the flour (1 to 2 cups at a time) into the liquid. Keep doing this until it feels like your arm is going to fall off (I tried making large batches of dough like this when I had a working Kitchen Aid mixer … it wasn’t pretty and is probably what lead to it dying). Then, on a large surface (counter top, kitchen table, whatever will work as long as it is sturdy) sprinkle about 1/4 cup or so of flour and turn your dough out onto the floured surface. Time to knead in more flour. This is where I used to mess up. When a recipe called for X-amount of flour, I used it all. The amount of flour you use depends on so many factors from the humidity in your house to the size of the eggs you use to what kind of flour you are using that you need to pay attention to how the dough is behaving to determine how much flour you really use for a certain recipe. I typically add (to the bowl) all but the last two or so cups, then add more flour while I knead. When the dough is ready place in an oiled bowl (I don’t have one large enough so I used my stock pot), cover with plastic wrap or a towel (I usually wet a towel with hot water, wring it out, and cover the bowl with it if I’m using a container that doesn’t like plastic wrap) and let rise until doubled (1 to 2 hours, depending on how warm your house is). Once it is risen, punch the dough down and place it onto a very lightly floured surface. Knead just a bit so you can form a nice ball, then separate into sections to make loaves or rolls. Now, get the egg wash ready. In a small bowl, beat the egg with the water and vanilla (if you are using it). 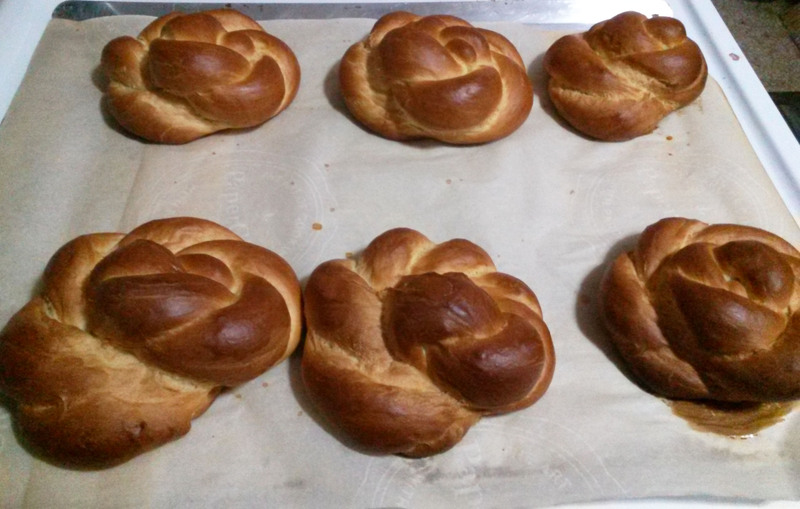 Each one of the loaves I did a 6-strand braid and the rolls were two strands each. You can shape the dough however you want. Once shaped, brush with the egg wash and sprinkle with sesame seeds (if using). Let the loaves rise until nearly doubled (1 or 2 hours). Bake for 30 to 40 minutes, until the loaves are a deep golden brown. Each one of my loaves were baked for 25 to 30 minutes and, because I got distracted, the rolls probably went for about 40 minutes. So, do you have canned carrots (or you could use older fresh carrots) that turned to mush and you don’t know what to do with them? 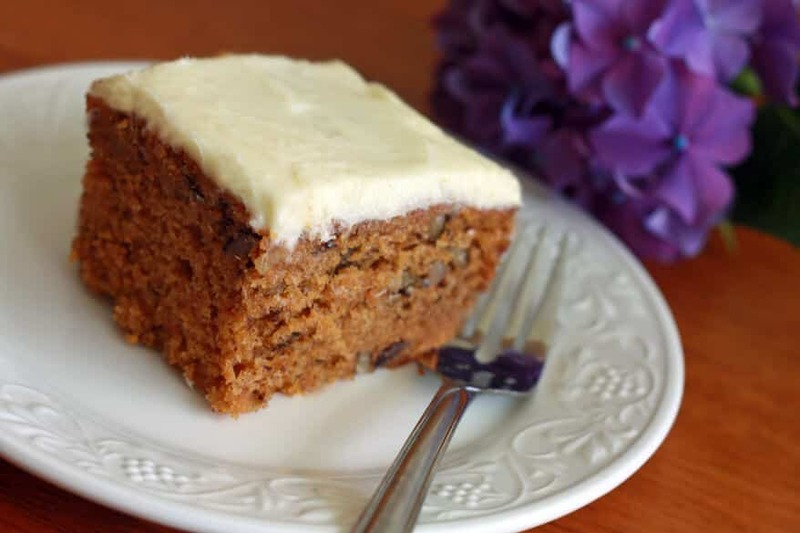 How about make a carrot cake! I’m also thinking this may be good with canned pumpkin and/or canned sweet potato. Note: I had one quart of thickly cut home canned carrots and ended up with about 1 1/2 cups of mashed carrots. I adjusted the recipe accordingly. I may or may not make the frosting but if I do, it will be with mostly Splenda with a bit of powdered sugar (I have come to the conclusion that Splenda tends to get bitter if using a lot … mostly because I kept trying to slip some in hubby’s coffee and he immediately noticed). 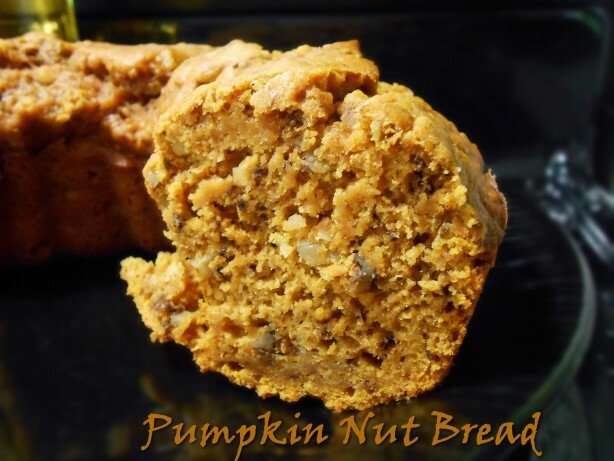 I know this is a bit late (should have posted this around Thanksgiving when all the canned pumpkin was on sale) but this looks like the best Pumpkin Bread recipe out there (like on my mom’s friend used to make). To produce 1 cup of evaporated milk, simmer 2 1/4 cups of regular milk down until it becomes 1 cup. In many recipes, evaporated milk may also be replaced with a combination of whole milk and half-and-half. For 1 cup of evaporated milk, use 3/4 cup whole milk and 1/4 cup half-and-half. Mix 2/3 cup non-fat dry milk with 3/4 cup water. HA! Something to do with Cream of Wheat aside from eating it “as is” for breakfast!